So truthfully, it still feels like I'm on a somewhat lame vacation. I'm waking up at almost a normal time, having a leisurely continental breakfast and taking a walk around the lake. Without the kids here the pace has slowed way down which has been good for a while but I can see the novelty wearing off and soon. After stretching the painkillers overnight to 8 hours, I decided to halve the dose this morning. Turned out well as it gave me just a little pain relief to deal with the neck and shoulder aching but didn't make me loopy. After last night's spectacularly trippy waking dream (mile-long waterslides manned by aliens ending in a vat of mac n' cheese), I wanted to try to keep my conscious hours as lucid as possible. I've not had any more dizziness today except for a few short episodes while on the second walk. Up to 5 miles, day 5. Surely I can't keep this up...or can I??? Day 5 Summary: Mental status = almost returned to normal. Phsically, lump in throat remains, albeit smaller. 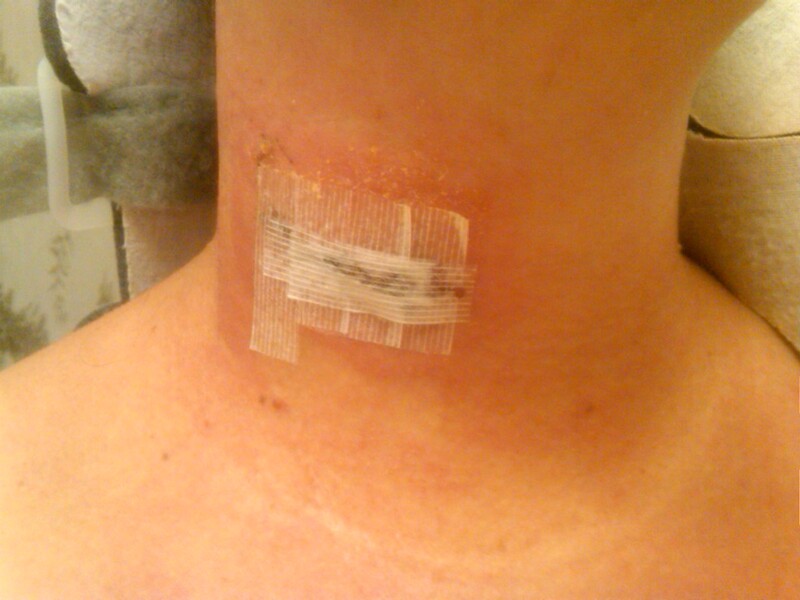 Skin around incision still numb and tender, rash maybe slightly less red. Strength a little shy of normal, ~90%. Pain minimal, shoulders and neck a little achy. Hi Kim! How'd your checkup go! I have this crazy idea they'll say I'm doing so well, I can stop wearing the neck brace...I also tweeted you in case you don't check your blog. Mine was 2-level c4-5, c5-6.